Rural Neighborhoods partnered with EnFamilia from Homestead to offer its first Summer Arts Camp in Immokalee. Collier County Parks and Recreation and Conservation Collier co-sponsored the camp which was held at beautiful Pepper Ranch in Immokalee. 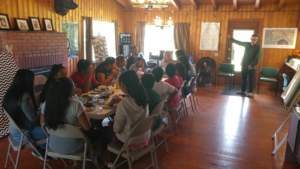 The camp served 15 students with the participants learning about visual arts and Mexican folklore/dance. Both organizations have partnered to host a larger camp in Homestead for over ten years, but 2018 was the first time the camp was offered in Immokalee. The camp is part of Rural Neighborhoods’ efforts to increase access to the arts in Immokalee. It was also a priority families identified in the EP2 community plan when they requested more cultural and arts programs for children. While at Pepper Ranch, the students took time to learn about Florida’s environment. They hiked, went fishing with a ranger at Lake Trafford, learned about Florida Panthers from Florida Fish and Wildlife Commission staff, and participated in a ranger-led drive over a portion of the 2500-acre preserve. The camp culminated Friday evening with a dinner and performance for family and friends. 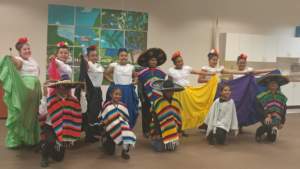 The event showcased the students’ art and their hard work in learning the dances which were performed in traditional dress. Rural Neighborhoods and EnFamilia look forward to offering the camp again next year to even more students. Other contributors to the camp include Guadalupe Center which provided transportation, David Lawrence Center which taught life-skills sessions, and NeighborWorks America which provided a Community Leadership Institute grant.